A week ago my husband, daughter, son in law, and myself took a trip to Wichita, KS to visit the Paramount Antique Mall. It was well worth the trip! In all my excitement I forgot to even remove my camera from my purse and use it! Take my word for it though, if you are in the area make sure to stop in and be prepared to browse for hours. During the 4 hour trip to Wichita, I crocheted the apron in the picture above and wore it the next day while shopping. I've also been very busy painting this little cupcake and I'm sorry to say to anyone who is interested, this painting is already sold. I will, however, be listing the print in my eBay and Etsy stores this evening. Twyla couldn't wait for that first tasty morsel when she saw this delightfully tempting treat! Loving your aprons!! I have been working on painting my kitchen table. I just did a post on it. Come See!! Your aprons are so cute! I can't believe how fast you whip them up. 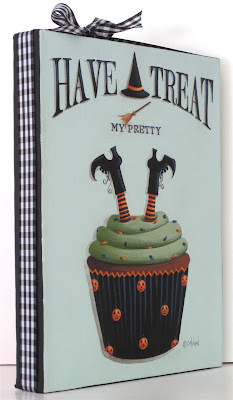 Cute painting and perfect for Halloween. The apron is really wonderful! 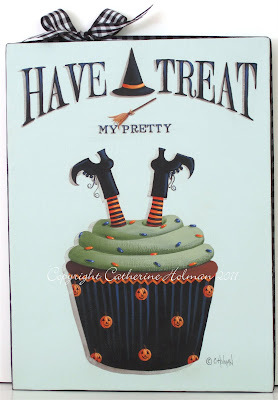 I love, love, love the Halloween Cupcake. I think when the print is available I'm going to have to get it for my youngest daughter! She loves Halloween! Fantastic job!! Catherine, love your halloween cupcake, it is adorable. Your aprons are amazing, cannot believe how fast you created them. I love that orange apron mom!!! I am gonna get that pattern from you tomorrow!!! That new painting cracks me up! Looks great! Adorable aprons, Cathie! I just finished painting the dovecote that hubby made, now I'm working on a marble roller. Your cupcake is so cute! Can I just say "adorable" I love your granny square aprons....how creative of you, of course, but then you are so amazing and talented. 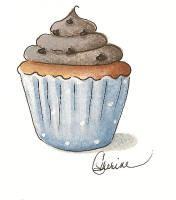 I am enjoying my cupcake's everyday! They bring a smile to my face. 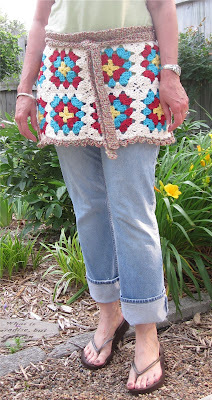 Lovely aprons.. there's always something new to learn in blogland.